KEYLON® PTFE is a unique thermoplastic and is resistant to almost all corrosive chemicals, except for alkali metals. Adding fillers to KEYLON® PTFE increases wear-life and hardness. Various other fillers available on request. PTFE Virgin Grade has the lowest coefficient of all materials and is ideal in applications where lubricants are not desirable as KEYLON® PTFE functions without any lubricants. PTFE has the widest working temperature range of all plastics, from -260°C to 260°C. PTFE is excellent for use in cryogenic applications as shows no embrittlement. 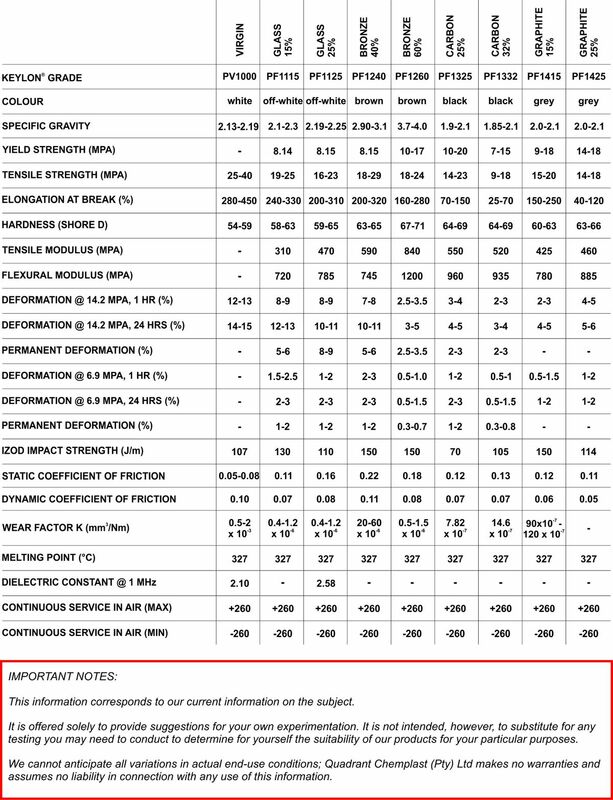 KEYLON® PTFE has very good sealing properties. PTFE is not flammable unless in 94% oxygen environment. 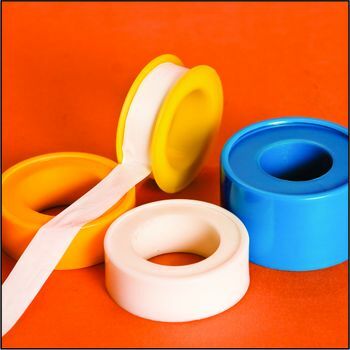 KEYLON® PTFE is an excellent insulating material. 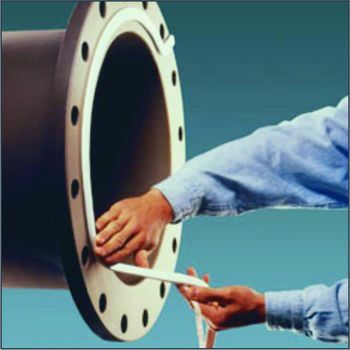 KEYLON® PTFE is not ideal in high wear abrasive applications or in high loading applications. Here filled PTFE is used to improve resistance to load and wear. Chemical applications, sealing applications, insulating materials in demanding electrical applications, and low friction applications. Gaskets, bearing pads, chemical equipment, valve seats, valves in gas cylinders, bellows etc. Bronze filled KEYLON® PTFE contains a copper/tin alloy providing a better creep resistance than most of the PTFE alloys. It exhibits improved thermal conductivity, with high load bearing capacity and hence is most often used in hydraulic systems. 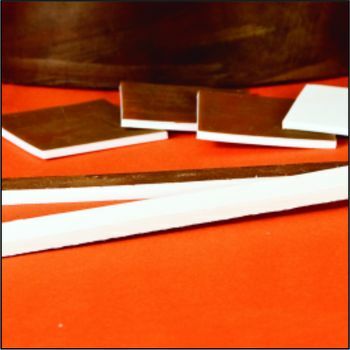 Bronze filled KEYLON® PTFE is both thermally and electrically conductive. The bronze enhances dimensional stability due to improved hardness, compressive strength and resistance to creep. Bronze filled KEYLON® PTFE is not to be used in contact with oxidizing agents. The major uses for bronze filled KEYLON® PTFE are: bearings, piston rings (hydraulics), valve seats and plugs. It is also used for support slides of heavy loads subject to several shocks. Glass filled KEYLON® PTFE is used to improve the creep resistance of PTFE over all temperature ranges, while still allowing some compression required for sealing in both gaskets and valves. Improved wear behavior is exhibited, while there is little effect on the electrical properties, as glass fiber is an insulator. Glass has an exceptional resistance to water. Glass must be avoided with the use of strong alkalis and hydrofluoric acid. major applications are: bearings and bearing pads, piston rings, valve seats & valve plugs and gaskets. Carbon filled KEYLON® PTFE is primarily used in applications where higher thermal or electrical conductivity is required, over and above conventional PTFE. This grade also exhibits improved wear life and has very good compression properties, for loading applications. Carbon filled KEYLON® PTFE has good abrasion resistance, load bearing, wear and frictional properties under sliding conditions, ranging from dry to fully lubricated systems. Our KEYLON® grade of carbon shows 10% better wear life over conventional carbon grades. Carbon filled KEYLON® PTFE is used in dynamic applications at high speed, as the thermal conductivity decreases the wear of the material resulting from heat buildup. Examples of these applications are: seal rings, piston rings and compressor rings. The good loading properties enable the use of carbon filled PTFE in higher load gasketing applications. Carbon is one of the best fillers to use in water applications. Graphite filled KEYLON® PTFE has improved thermal & electrical conductivity over virgin KEYLON® PTFE. 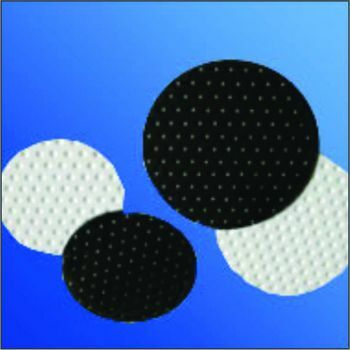 Due to the unique planar structure of graphite, it exhibits better lubricity and thermal conductivity than carbon filled PTFE and is a softer filler. It has a lower coefficient of friction compared with carbon filled KEYLON® PTFE and is easier on machining. It has improved wear life against soft to medium hardness surfaces. Creeping bearings used at high speed in contact with medium hardness surfaces. Special fillers can be mixed on request. Mitsubishi Chemical Advanced Materials Chemplast manufactures PTFE (polytetrafluoroethylene) in a wide range of forms and sizes to optimise the production and cost of your component parts. 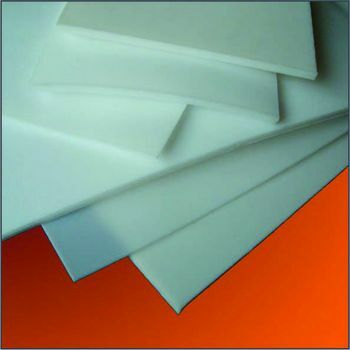 KEYLON® PTFE Dimpled Sheets. Dimpled sheets are the perfect solution to thermal expansion and load problems usually connected with structural elements. Standard dimpled sheet is 4.5mm thick.